This book is Lash's most comprehensive statement in social and cultural theory. It is a book addressed to sociologists and philosophers, to students of urban life, modern languages, cultural studies and the visual arts. Alongside the Enlightenment has emerged another modernity. 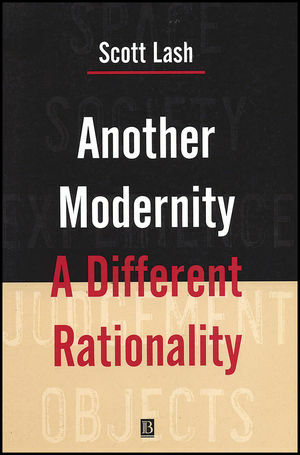 This second modernity has - in opposition to the Enlightenment rationality of progress, order, homogeneity and cognition - initiated a different rationality of uncertainty, transience, experiment, and the unknowable. This second, this other modernity, is present in notions of 'difference' and 'reflexivity' so central to the contemporary world-view. The logic, however, of such notions can, itself, lead to the same unhappy abstraction of the first modernity. What is forgotten, Scott Lash argues, is the dimension of the ground. This book consists of explorations into this ground: as place, community, belonging, sociality, tradition, life-world; as symbol, sensation, in the tactile character of the sign. The book addresses the other modernity's forgotten ground. The first and second modernities co-existed in a state of irresolvable tension along the history of western industrial capitalism. This is thrown into crisis, Lash argues, with the turn of the twenty-first century emergence of the global information culture. What are the implications of this explosion of first and second modernities into today's technological culture? When the previously existing third space of difference is exploded into the general indifference of information and communication flows? How might we lead our lives in an age in which difference - and indeed the ground itself - become primarily a matter for memory, for mourning? Scott Lash is Director of the Centre for Cultural Studies and Professor of Sociology at Goldsmiths College, University of London. He previously taught at Lancaster University for many years. He was a Humboldt Fellow in Berlin between 1988 and 1990. His previous books include The End of Organized Capitalism (co-author, 1987), Sociology of Postmodernism (1990), Modernity and Identity (co-editor, 1992), Economies of Signs and Space (co-author, 1994), Reflexive Modernization (co-author, 1994) and Detraditionalization (co-editor, 1996). His books have been translated into nine languages. 2. The First Modernity: Humans and Machines. 3. Simulated Humanism: Postmodern Architecture. Fields of Mapping: Grids and Labyrinths. Productions of Space: Classical and Gothic. The Other Modernity: Lived Space in Japan. 5. From System to Symbol: Durkheim and French Sociology. 6. Symbol and Allegory: Simmel and German Sociology. 7. The Natural Attitude and the Reflexive Attitude. Alfred Schutz: from Meaning to Understanding Signification and Existence. 8. Difference and Infinity: Derrida. 9. Reflexive Judgement and Aesthetic Subjectivity. Finality of the Object, Singularity of the Subject. 11. Objects that Judge: Latour's Parliament of Things. Morphisms Weavers and Object Trackers. Networks: Spiralling Time and Space. From Cité to War Machine. From the Mental and the Instrumental: The End of the Gaze. Polar Inertia: The Last Vehicle. 13. The Symbolic in Fragments: Walter Benjamin's Talking Things. Allegory: The Aesthetics of Destruction. * An original contribution to debates now at the core of social and cultural theory. * Brings together the themes that Scott Lash first broached a decade ago, this is the authors definitive statement in social and cultural theory.